Speaking outside the White House on Friday, President Trump was asked about Apple's recently revised revenue expectations, where the iPhone maker warned it is aiming for $84 billion for the holiday quarter, down from the $89 billion to $93 billion it originally anticipated. Trump started his response to the query by offering the bizarre claim the firm had "gone up a lot. They've gone up hundreds of percent since I'm President. Apple was at a number that was incredible, and they're going to be fine." While it is certain that Apple is going to be fine, the company's stock price has not varied quite as far as Trump claims. At the time of the President's inauguration on January 20, 2017, AAPL was trading at $121. The stock price rose beyond $230 at its peak in October, representing a maximum improvement of 90 percent during his tenure. At the time of publication, Apple's share price hovers at around $148. Trump continued his comments, alluding to the reduced revenue in China causing part of Apple's reduced expectations. Trump said "Apple makes their product in China. I told Tim Cook, who is a friend of mine who I like a lot, make your product in the United States, build those beautiful plants in the United States." The President went on to claim China is the "biggest beneficiary of Apple" due to handling most of its product manufacturing in the country. However, Trump also highlighted the company is "investing $350 billion because of what we did with taxes and the incentives that we created in the United States." "My focus is in the United States. I want to get those companies to come back like so many are doing into the United States," insisted Trump. 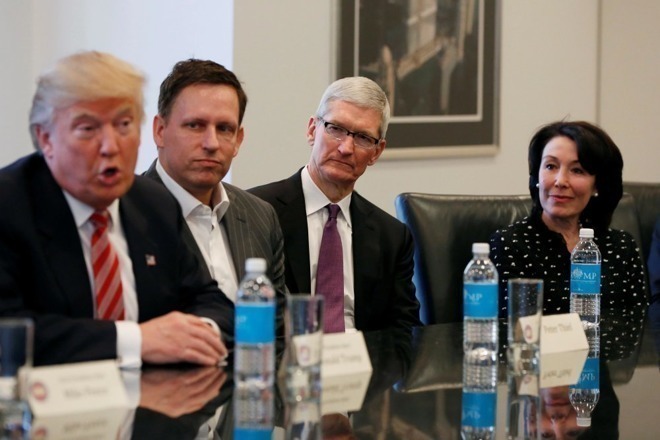 "I want Apple to make their iPhones and all of the great things that they make in the United States, and that'll take place."